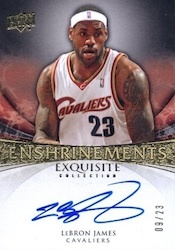 2008-09 Upper Deck Exquisite Collection Basketball is one of the brand's best sets. As usual, the super premium set is loaded with autographs and memorabilia from the game's top players and legends. But so does every Exquisite set. What sets this one apart is its rookie crop, which has one of the NBA's most popular players, a pair of second-tier superstars and a handful of solid picks. 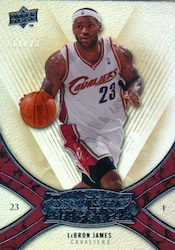 The 2008-09 Upper Deck Exquisite Collection Basketball base set has 60 cards, all numbered to 225. On top of those are 40 autographed rookie cards. All but six have a patch as well. 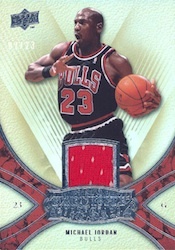 Rookie cards are numbered to either 225 or 99. By far, the standout of the rookie crop is Derrick Rose, the youngest player ever to be named the NBA's MVP. 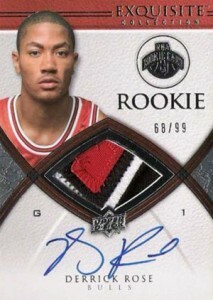 Not only is the Derrick Rose rookie card considered the best in this set, but it's one of the top rookies in any Exquisite set. 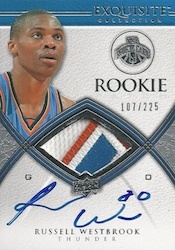 Kevin Love and Russell Westbrook also have autographed patch rookie cards in the release. Other first-year players include O.J. Mayo, Eric Gordon and Michael Beasley. 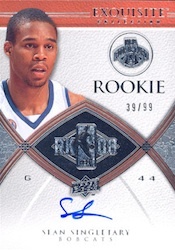 Every single-pack box of 2008-09 Upper Deck Exquisite Collection Basketball has one rookie card. Most of the autograph and memorabilia inserts in the release are numbered to 25 or less. 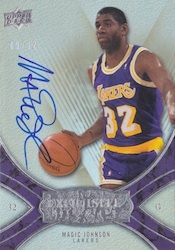 Popular returning sets include Emblems of Endorsement (#/10), Enshrinements Autographs (#/25) and Noble Nameplates #/25). All autographs are signed on-card. 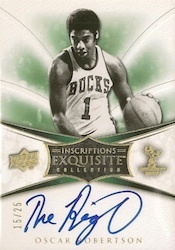 2008-09 Upper Deck Exquisite Collection Basketball boxes have five cards including an autographed rookie card, an autographed patch card, one autograph, and autograph or memorabilia card and a base card. The final card is either another base, a parallel, an autograph or memorabilia card. Random boxes feature only cards of a single player. A total of 15 stars make the list, including Michael Jordan, Kobe Bryant and LeBron James. 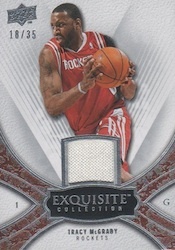 2008-09 UD EXQUISITE 23 50 BRANDON ROY AUTO 22 22 EQUALS 1 1 ?